An image from Vaught’s Practical Character Reader, published in 1902. Credit: Public Domain Review. precisely what “nasology” sought to accomplish. 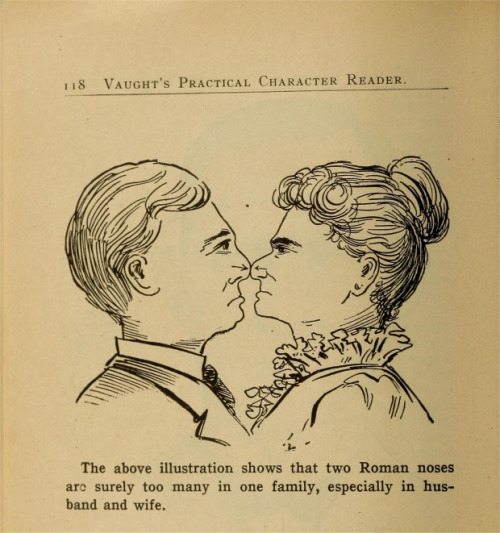 This 19th century pseudoscience proposed a link between an individual’s moral character and the physical contours of their nose. In other words, a nasologist could determine levels of intelligence, industry or criminality, among other things, through a simple nasal examination. It may sound absurd today, but nasology, like phrenology (which believed character could be seen in the shape of an individual’s skull) had a real influence on the medical practices and cultural values of 19th century America. Eddy Portnoy, a professor of Jewish Literature and Yiddish Language at Rutgers University, explained the origins of this strange and fascinating pseudoscience, including the possibility that it may have started as a joke. “Number one is the Roman nose, which is aquiline and convex. It’s an indicator of great decision, considerable energy, firmness, absence of refinement, and disregard for the bienseance of life. [Bienseance] is a French term that’s thrown in there. It’s sort of the enjoyment of life. The second category is the Greek category. That’s a straight nose. It indicates ‘refinement of character, a love for the Fine Arts, and Belles Lettres, astuteness, craft, and a preference for indirect action.’ If it’s not obvious, I’m quoting directly from the book. If the Greek nose is slightly distended at the end, it indicates the most useful and intellectual of characters as the highest and most beautiful form which the organ can assume. The third category is the cogitative, or the wide-nostriled nose. This indicates a cogitative mind, having strong powers of thought, and given to serious thought and meditation. The fourth category is the Jewish, or hawk nose. And it is very convex. It indicates considerable shrewdness in worldly matter, a deep insight into character, and facility of turning that insight into profitable account. It’s also known as the commercial nose. While named for the Jews, it is not exclusive to them, nor is it confined to them. So it may be that you’re not Jewish, but you happen to have this type of nose. Which also indicates that you are good at business. Nasology gains influence, but may have started as a joke? “You know, my feeling is that he intended it to be a kind of satire on phrenology. Sort of a send-up of it, which is somewhat strange, because it’s a 250 page joke, if you look at it that way. This segment comes from Beach Bodies, our episode on the changing ideas about the American physique.